My new book ‘Speaking the Piano‘ is noted as being of interest on the Bookshelf page of New Yorker music critic Alex Ross’s influential blog ‘The Rest is Noise’. Let’s hope this mention will bring the book to the attention of some American readers! Some of my best correspondents on this blog are readers in the United States, but I would love to add to their number. This entry was posted on Friday 29th June 2018 at 7:41am	and is filed under Books. You can leave a response, or trackback from your own site. I am one of the “American readers” you mention in your post above. 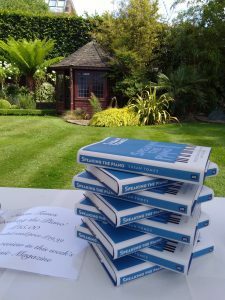 I have very much enjoyed reading several of your books this year, having been introduced to them through another piano blog (can’t remember which one…). I am a pianist with choral and vocal accompanying experience, and a tiny bit of recording experience as well, and the way you write about the joys and challenges of collaborating with other musicians resonates with me. You are able to put into words what is in my heart when you write about life as a pianist. Congratulations on the release of your new book, and I can’t wait to read it! Cori, for some reason I missed seeing your comment until today, sorry! Thank you so much for your kind words. It’s very nice of you to take the trouble to write to me. I enjoyed your comments even though I saw them a month late! I am also an American reader who thinks your books are extraordinary. They express what I think and wonder about, and they give me some answers, too. I am an amateur pianist in Washington, DC, who belongs to a piano club (The Friday Morning Music Club – our group meets on Monday.). We are a group of pianists who enjoy studying music, playing music. We enjoy music. We are not comfortable playing for an audience, so we have this section of the club which meets monthly and prepares music to share with the group.We also share lunch. But we do not discuss our performances. We do encourage each other. I did enjoy reading your descriptions of your pianist gatherings. Thank you so much for your writings.